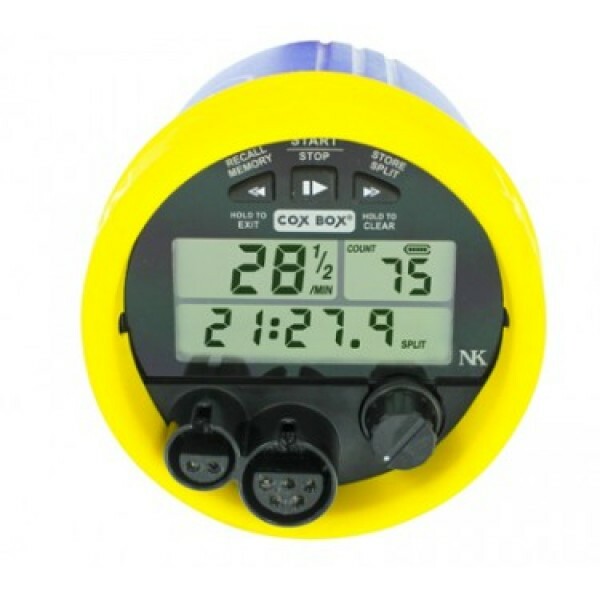 Rowing’s original waterproof timer-amplifier now has a removable battery for easier charging, overmolded connectors for protection from wear and brightly colored rubber bumpers for durability and easy identification in the boathouse and at team events. Note: The CoxBox comes standard with battery and rubber bumpers only. Microphones and chargers must be purchased separately. Each CoxBox leaves our factory fully charged. If it’s been awhile since you bought your CoxBox, or you have one that has been used before, use one of the two compatible chargers from NK. We recommend using the cradle charger over the basic charger because it causes less wear on the connectors on the front of the CoxBox. It’s also not a bad idea to take an extra battery with you out on the water. NK makes two types of microphones: one with a BNC (metal) connector on the end of the wire, which is compatible with the old-style (metal can) CoxBox, and one with an R2 (rubber) connector on the end of the wire, which is compatible with this CoxBox (and all others made in 2008 or later). The wire you’re looking for in the boat is called the A+ harness. The connector on the end of this wire looks like the one at the end of the microphone wire, only bigger. Line up the pins inside this connector with the holes in the black plastic receiver that jut out from the face of the CoxBox. If it’s not connected, you’ll still be able to turn on the CoxBox, but you won’t get a stroke rating or hear any sound through the speakers. Chronograph: 00:00.00 to 59:59.99 with auto roll-­‐over, 1/100th sec. resolution. Stroke Rate: Rate input from seat sensor, autostart with first stroke, 10-127.5 SPM range, 1/2 SPM resolution. Stroke Count: Rate input from seat sensor, autostart with first stroke, 0 to 999 with auto roll-over, 1 stroke resolution. Memory: Stroke rate automatically stored every 10 seconds, up to 42 minutes and 40 seconds stroke rate, count and time can be manually stored at the press of a button. Backlight: Blue/green electroluminescent backlight, auto-on. Case: Injection-molded polymer case, acrylic lens, injection-molded elastomeric bumper. Controls: Knob (on/off/volume), 3 buttons with tactile response (start/stop/split/memory). Battery: Three cell lithium polymer rechargeable with on-board fuel gauging. Charging: 930 mAh, 10.3 Wh. Performance capacity varies greatly with volume and quantity of speech as well as number of speakers. 3 hours expected in Cox Box with 3/4 volume, talking 50% of the time, using 3 speakers. As much as 10 hours with more intermittent use, such as with Blue Ocean Megaphone. Life Expectancy: 3 hours at typical use (3/4 of full volume, talking 50% of the time, using 3 speakers). Temperature: Charging: 32 to 113°F | 0 to 45°C; Operating & Storage: -4 to 113°F | -20 to 45°C. Size: 4 in x 4.5 in (tall x diameter) (101.6 x 114.3 mm). System Weight: 20 oz (567.09 g) for control unit, battery pack, bumpers; 4oz (113.4 g) for battery pack; 2lbs (907.2 g) for complete system for 8+ with 3 speakers. Water Resistance: Waterproof (IP67, NEMA-6). Buoyancy: Control unit with battery pack installed and microphone attached floats. Control unit alone floats. Battery pack does not float. Warranty: Two-year warranty on entire system.